This blog post is intended primarily for the families and care-providers of Precious Seeds students; however, it may also be useful for any person who is new to yoga and is interested in a very brief summary of the intentions of yoga as expressed by Patanjali, the sage who wrote one of yoga’s watershed texts: The Yoga Sutras. The Sanskrit word “Sutra” means ‘to thread’ or ‘stitch together’, relaying the embedded nature and interconnectedness of yoga. While the eight limbs will be explained here in a list fashion, it is useful to understand that they are not intended to be experienced as a hierarchy, but that one may flow through any of the limbs and any given time. Several of the limbs naturally ‘fit’ together, and in my own personal and professional experience, if you are new to these ideas, I would suggest making your way through the list in a linear fashion to understand the infrastructure of Classical Yoga. Then you are free to concentrate on any limb in any order as it serves. The entirety of this framework is holistic, comprehensive, and is founded in science and philosophy; however there is also most certainly an ‘art’ to yoga, given the vast creativity that has been applied to the practice, especially here in the West. Please remember that this is a brief explanation intended to provide a context for the Yogademic Year at Precious Seeds Montessori Schools. It also feels important to point out that yoga is not a religion. Yoga is often referred to as a wisdom or contemplative practice; a comprehensive system that is based in science, philosophy and the lived experience of the practitioner. Yoga is not dogmatic, rather, provides suggestions or guidelines for living a life that is ethical and sustainable, built upon the discipline of practice in moving the body, breathing and focusing the mind towards joy. The true roots of Classical Yoga are about ethical behaviour. The first two limbs are entitled Yamas and Niyamas, and they work very well together. In my mind, they are like two halves of a whole, and both must be present in order to live a balanced life. Ahimsa: Non-Harming, or non-violence. I reframe this as compassion and kindness for children. Satya: Truth or truth-telling, though it is critical to temper truth-telling with Ahimsa to ensure the truth does not cause undo harm. Asteya: Non-stealing, or not taking without permission. I reframe this as taking only as much as you need, living simply and learning to not act on impulsive cravings. Bramacharaya: Energy management, or restraint. This is another ethic about not giving in to impulses, including over-commitment, and/or being busy all the time. With children, I frame this as being mindful of your own thoughts, feelings and actions, and noticing how those impact others around you. Aparigraha: means avoiding hording or compulsively collecting. With children, I reframe this as being generous, sharing and appreciating living simply. Saucha: Purity and cleanliness in body, mind and soul. With children, I focus on thinking good thoughts, especially about yourself, and about the importance of cleanliness in the body for health, and cleanliness of work areas for organization. Santosha: Contentment and being positive. Contentment can include the practice of being grateful for what you already have, for being happy with yourself and who you are, and for offering blessings for what you receive. Tapas: is about applying heat to discipline, or fire to a task. With children, I talk about being disciplined in completing tasks, and then focus on how good that feels to complete something you started. We also discuss forming good habits as tapas. Svadhayaya: Self study and education. This niyama intends for us to know ourselves well enough that we can meet our own needs, and is also about asking for help when we need it. Knowing the self well helps to ground us and acts as a wonderful prevention mechanism against peer pressure and temptations. Ishvara Pranidhana: Devotion to something bigger than yourself. Traditionally this niyama is about surrendering to God, though in an effort to be non-secular as an educator in both private and public school systems, I reframe this as cultivating an appreciation for the natural world and honouring the religious and/or spiritual belief systems of your own family. Asana is probably the most popular and well known limb of the yoga-tree. Asana refers to the poses or body shapes we enter during physical practice. Asana builds strength and flexibility in the body, which in turn, builds strength and flexibility in the mind, especially through practice. With children, asanas focus on safe alignment, building appropriate developmental gross and fine motor skills, and on having fun being in their bodies. Pranayama is another well known limb of the yoga-tree, as it refers to breath work, or breathing exercises. Prana means life, and in breathing, we are moving life force energy through our bodies which can have direct effects on our psychology and cognition. For example, breathing slowly and fully can help us to reduce anxiety and aid in clear thinking. 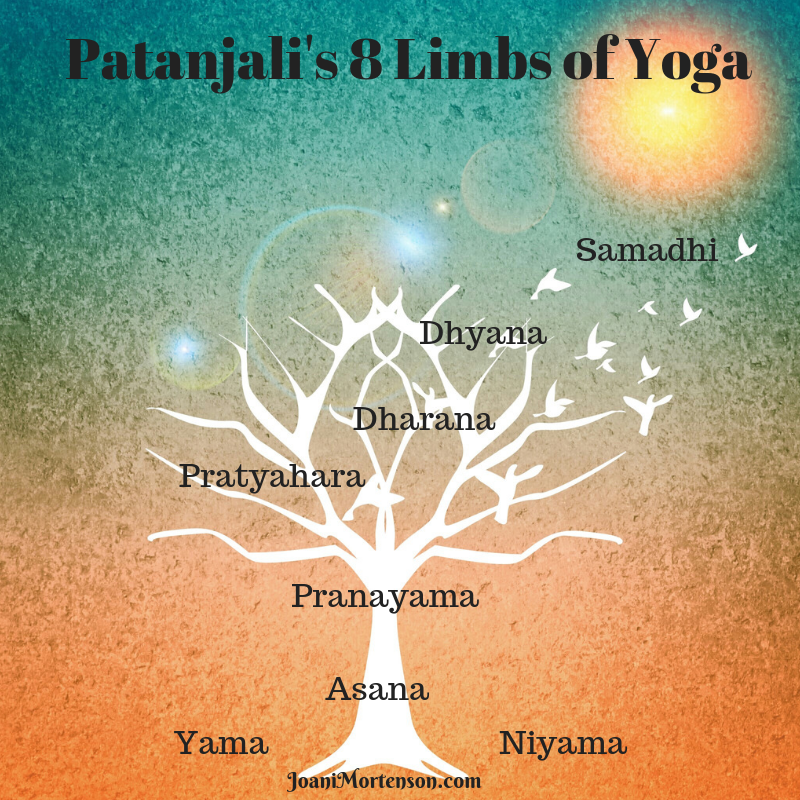 Pratyahara is a very important limb of the yoga tree because it is all about the senses. In Classical Yoga, pratyahara describes the process of turning away from external stimulation, guiding our energy, thoughts and senses inside with the goal of learning how we feel from the inside, without outside influence. With children, I talk about paying attention to their inner world: thoughts, feelings and behavioural motivations. Dharana is about focusing the mind, specifically on a single point, like the breath. When the body has been warmed by movement, and the mind focused through informed breathing and intentional management of the senses, it becomes easier to focus the mind towards single mindedness, towards casting attention in an intentional way. With children, I talk about how movement prepares us and makes us better at focusing. This is a valuable lesson I’ve learned through my many years of working with children: if they are struggling to focus, get them moving first. Help them breath deeply and fully, and suddenly, focusing becomes much easier. Dhyana is about achieving the state of meditation, or flow. Children are especially skilled at moving meditations, such as twirling or soaring for no apparent reason, other than for the sheer joy of experiencing rhythmic movement. With the right preparations, I also find that children love stillness, quietude and silence. More about this in upcoming posts. Samadhi translates into bliss, and for many, this is the objective of yoga as a practice, to feel and experience bliss. Bliss can be described as transcendence, as open awareness without resistance, as joy that is unbound and limitless. As you well know, children can be much more adept at bliss than adults! Samadhi is not hard for children to achieve. However, we still talk bout the usefulness of joy and bliss in a balanced life, and how we might support it in others through good deeds, mindful attention to our teachers and parents, and through enjoying the natural world. I hope you enjoyed learning more about yoga and how this incredible practice my help your children through the promotion of self-regulation, self-reliance, developmental movement, breathing and meditation. If you have any questions or concerns, please do not hesitate to connect with me directly, or with the Director, Miss Christine. This service is provided to your children as a choice. Each child chooses for themselves if they wish to participate, to observe or to choose another activity. It is also common for children to join in for a portion of the session, and to decide to move on when it feels right for them. Parents are most welcome to observe. I teach on Wednesday mornings at both locations. Try asking your children regularly about what they are learning in yoga. I’m certain they’d love to share their learning with you, and they’d probably love to teach you a thing or two! Over the next few months, I will be providing more in depth material on the yamas and niyamas, a major focus of our yoga curriculum this year. Look for Children’s Ethics Stories, as well as ideas for living and learning each ethic. Iyengar, B.K.S. (2001). Light on yoga: The classic guide to yoga from the world’s foremost authority. London: Thorsons Publishing.